I've always lived where things have gotten stolen, and it looks like I always will. When I first moved to Phoenix, I lived in a "sketchy" neighborhood that hardly even seemed to be safe to walk around in, especially at night. It certainly wasn't a safe place to leave your car doors unlocked, or to just leave a bike leaning against a fence! And when I moved to another "sketchy" neighborhood in Tempe, I made a point to bring my bicycle into my apartment. I also didn't go out wandering around at night. When I moved into some "sketchy" neighborhoods in the Los Angeles area, I was also cautious. I have to admit that it jangled my nerves to always hear car alarms, or the wail of police sirens day and night. And I wanted out of those neighborhoods! But it turns out that there's really no getting away from worrying about your stuff getting stolen, as long as you have stuff. When I moved into my safe little suburban neighborhood, where I still am, in Glendale, Arizona, I kept locking everything up. I put my car in the garage, locked, and closed the garage door. I installed security doors. It did seem kinda paranoid of me (I was still imagining that I felt earthquakes!) and then my neighbor's Lexus got stolen from his driveway. And over the years I've known a lot of wealthy people who live in pretty much the same nervous state that I was in way "back in the day" in California. The solution, of course, is to own no stuff. I've never really met anyone like that, even the transient people I've known have had to worry about their shoes being stolen while they slept on the beach. And so I've been trying to remember when I owned no stuff - it was when I was about four. I remember that because when I was 5, my "Vrooom" motor was stolen off of my bike. My parents had bought me the bike, but the Vroom motor (it just made noise, and mounted on the handlebars) I had won in a coloring contest from the Post Cereal Company. And it hurt my feelings when I walked back over from T-Ball practice at the park, and it was gone. Luckily, my training wheels weren't stolen, so I could get home. Now as I go into my golden years, I'd like to believe that, aside from a few hearts, and kisses, I haven't stolen anything. I grew up reading comic books, and I wanted to be the good guy. The man I wanted to grow up to be would the Lone Ranger, or Zorro. Now when I look in the mirror at my grey hair I see Don Quixote. But never a bad guy. Never, ever. But it turns out that there are no bad guys, only little animals that feel that they need to take things in order to survive. And there's no getting away from having stuff stolen, because even on your big ranch in Montana, there will probably be raccoons! 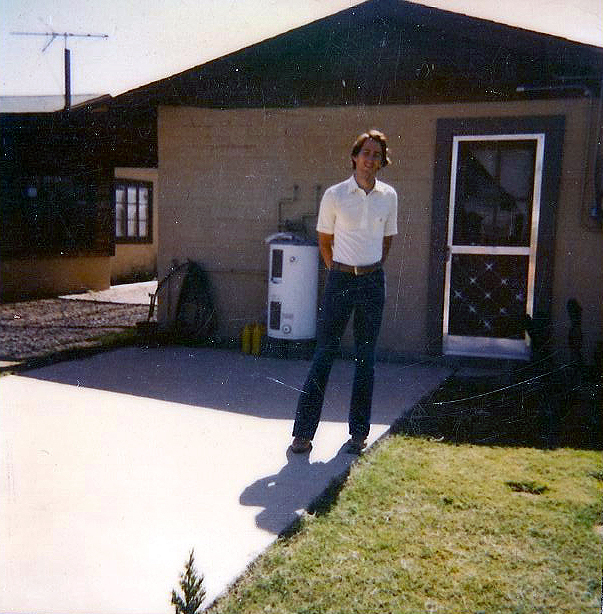 Image at the top of this post: In my "sketchy" neighborhood in 1982, Tempe, Arizona.